It’s Family Day in BC and that means most people have the day off… so I knew today the beach would be full of dogs. Fergus loved Willows and we went there almost every day during dog season (beach is closed to dogs during the summer). 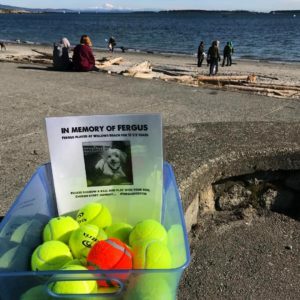 What a great way to remember Fergus and for other dogs and their humans to have a little fun! Wow — that gesture that is Just Right in so many ways! I’m grinning all over just thinking about it … and thinking of Fergus.